The full moon a couple of weeks ago was a sight to see, her glow more impressive than normal, her size unmistakable. You couldn’t escape her shadow. But in its recent world premiere, the play fails to capture the blinding light from this inspiring impetus. It suffers from common first-draft collisions, and though it offers moments of woven clarity, it ultimately loses its grip on itself before it has a chance to be saved. It is threadbare despite its many threads. Lambert completes his three-parter with a trilogy of its own. Under his literary moon, we hear of three pairs of souls, each darkened by deep shadows. The three stories could not be more different from each other, and the play’s inability to find itself despite these wayward focal points is disorienting, even disheartening. It takes too much work to decide what we’re watching, which is a shame for many reasons, not the least of which is Lambert’s beautiful sentimentality. At the heart of “Buffalo Moon’s” mythology is the autobiographical story about Lambert’s relationship with the late playwright, director and actor Maxim Mazumdar – after whom Alleyway Theatre’s annual new play competition is named, and after whose Montreal-based Phoenix Theatre, Lambert’s Johnson Park space is named. The romantic, artistic and tragic pins on their story – Mazumdar died of complications from AIDS in 1988 – make it the strongest and closest to home to Lambert’s heart and to the vision of Lambert’s Buffalo. That “Buffalo Moon” exists at all, in this daring, experimental theater, is in memoriam to this love story. But Lambert, with the greatest due respect to his material, does his own life’s story a disservice by trying to connect it to stories that might have been better left as inspiration and not actual material. Something so pure doesn’t need context for clarification, just honesty, brevity and depth. One distraction involves the true story of Anthony Capozzi (played by Eric Mowery), whose wrongful convictions in two of Buffalo’s “bike path rapes” were dismissed in 2007, after he served 22 years in prison. The other is between Angel (Michele Costa) and Seuss (Franklin LaVoie), a small bird and deer whose unlikely friendship was virally followed in Forest Lawn a couple of years ago. Inordinately unique from one another, these stories – mother and child, lover and lover, bird and deer – are told insufferably in tandem, utilizing a variety of theatrical tropes, musical styles, narrative devices and language styles that never find definition. It is as mixed a bag as it sounds, and never wrapped in as much whimsy as it seems to think it has. It’s three different plays – each with its own modicum of exquisiteness and taste – that share the umbrella of a moon, the universal scope under which anyone’s romantic tale might be relevant. The company does a fine job for the most part, even if they sometimes appear unsure of what they’re doing. Nick Lama delivers a most grounded, compelling portrayal as Richard. The strength of his performance, full of Lambert’s effervescent physicality and spirited personality, leads the evening’s ship with grace and subtlety. Wendy Hall is finely tuned as both Lambert’s entertainer mother Mary and Capozzi’s conservative, aged mother, Betty, in whose dramatic monologues Hall may catch your breath. 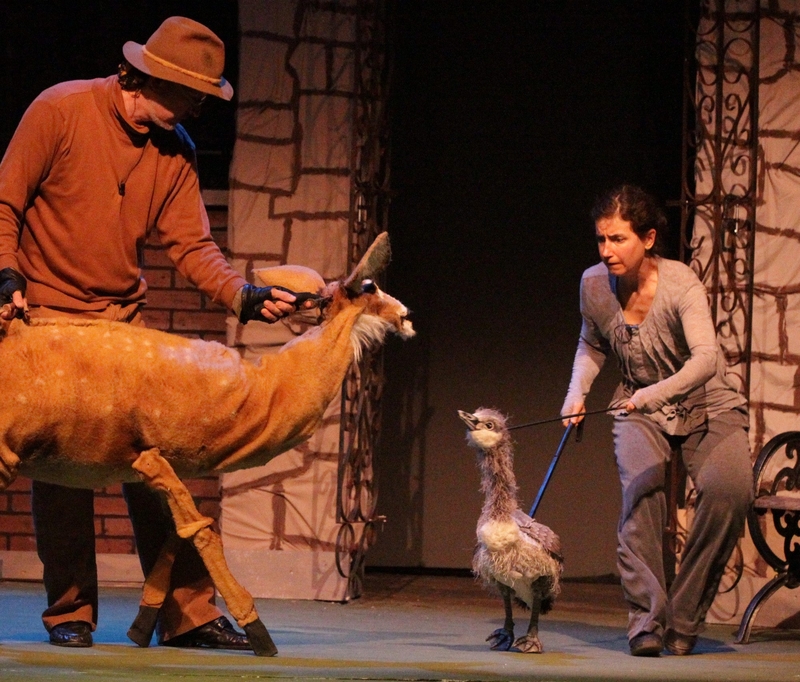 Puppeteers Costa and LaVoie bring beautiful life to our animals, Costa once again sharing her elegant craft to our delight. Unfortunately, her talents alone still can’t save from the distraction her inclusion creates. Steven Borowski’s original music, instrumentation and arrangements, with help from Tom Makar, also is off-point, beautifully composed and presented as it tends to be. Each song feels as though it’s from a different show, and even if sonically attractive, is almost never in alignment with the voice of its characters, or their time and setting. It’s hard to put much of the blame on director Drew McCabe, who has a rough script to work with – and one I hope will continue to be developed. He understandably can’t juggle the overcrowded voices he’s given. But with so many talented minds on deck, and with such reverence for its heartfelt goal, it’s impossible to figure out just what this musical wants to be: Is this a whimsical piece of sunny-day charm; a woeful, precautionary tale of regret; or a realistic romance set against a big-city rollercoaster? It’s too much for us to sift through, but hopefully, with the aid of its own glow, is enough to yield something bright and beautiful.